The Certificate in Investor Relations professional qualification is now regarded as an essential prerequisite for those entering the investor relations profession in the United Kingdom. Starting in the first quarter of 2009, MIRA is pleased to offer the same quality of professional development available in the UK to IR practitioners in Malaysia. The CIR is offered in collaboration with the Investor Relations Society, UK’s professional body for IR, highly regarded as a leading authority on IR in UK and Europe (with 80% of companies on FTSE100 on LSE as its members) and among the earliest established professional bodies for IR. The CIR allows IR practitioners to enhance their IR capabilities and benchmark against international best practices. It allows listed companies to identify qualified IR professionals to strengthen their IR function. The CIR is also an opportunity for development for professionals from financial intermediary roles such as investment banking and equity research who want to make the cross-over into listed companies. 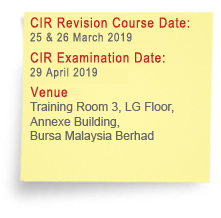 Kindly prepare the payment for the CIR processing fee and CIR revision course fee to Malaysian Investor Relations Association and remit the payment directly to our bank a/c below and fax/email a copy of the remittance advice to us for our records.